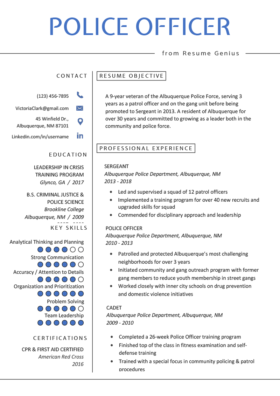 Download our one-of-a-kind firefighter resume sample, or browse hundreds of DIY resume templates. Below, we’ve included resume writing tips from industry experts. Firefighter with 15 years of experience in firefighting and emergency care. Possess exceptional quick-thinking and calm attitude during high-pressure situations. Proven track record of collaborating with team members to suppress an array of fire levels that minimize escalations. Firefighters are our daily unsung heroes who risk their lives to ensure that no harm comes to us. They lead dangerous lives, and as such need to follow correct protocols to ensure the safety of our community. Firefighters need continuous training and require a level-headed mind to make quick decisions during emergency situations. Depending on where they live, they can also earn an above-average wage. Are you a veteran? 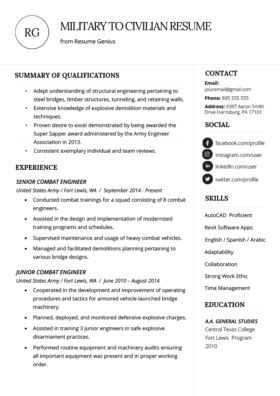 Learn how to write a civilian resume as a military vet. If you are thinking of becoming a firefighter, then you should consider the above data when deciding where to work. However, before you can start thinking about where to work, you’ll first need to build your resume. Adding certifications can be done in one of two ways. If you have a lengthy list, then create a certifications section that you can place right after your resume introduction. On the other hand, if your certs are a bit lacking, then go ahead and include them in your additional skills section at the bottom. Choosing an introduction is an essential part of the resume writing process. Job seekers have four choices when it comes to adding an introduction: the statistics-based professional summary, the widely used career objective, the skills-based qualifications summary, and the powerful professional profile. Essentially, he has laid out his argument of why he is the best candidate for the position, and has given the manager a reason to read the rest of the resume. A career objective is a great way to start a resume for some people but may not be the best way for you. Use our easy flow chart to determine which resume introduction best suits you. Medical Assistance is the #1 reason for firefighter response. Check out more firefighter statistics here. The above bullet point proves the exceptional service that this candidate has given. An award like this is a token of appreciation from the city for the hard work that this firefighter does on a daily basis. As shown above, the firefighter has to understand the tools that he uses to ensure that he can fight fire. By maintaining it, and being able to make minor repairs, the firefighter can ensure that he can do his job during critical and sometimes life-threatening situations. Here, the candidate showed that he was able to successfully control fire from escalating with an initial small team, while waiting for a support team to come. Quick thinking and the ability to work under pressure is essential in this line of work. Tips on how to write an achievement-centered resume. Need more action verbs? No problem. Stop by our longest action verb list in the universe.